Sign RDP files with certificate is driving me mad! Have you deployed a server 2012 configuration with Remote Applications? If you have then I’m sure that, like us, you find the whole process of signing RDP files with certificates a pain! Microsoft ‘kindly’ decided to change how Server 2012 handles RemoteApp distribution and as such no longer offers the ability to generate RDP files … *sigh* … We cannot even generate an .msi file in which to extract them from either! In each of the above situations though we only have basic RDP files, what about if you want them signing with a certificate??? Well there’s only one option really, sign them yourself using rdpsign.exe, a certificate, the certificate thumbprint and command prompt … In short, a rather cumbersome and annoying process. As with our other Tips & Tricks articles you can find the technical explanation of how the solution works in the ‘Geek Speak’ section at the bottom of this article. You may download and install RDPSigner from the link below. Please be aware that if you are installing this utility onto a server itself (rather than a workstation machine) then make sure to use the ‘Server’ version of the utility so as to not affect any other server files. Please be assured that the download from our site is virus free, however, as always we would advise you to always scan downloads for your own peace of mind. NOTE: Some software can adjust the ‘Environment Variables’ on your machine to the point where RDPSign.exe will not be detected. If you find that all attempts to sign files are failing you will need to manually add an entry back into your Environment Variables. 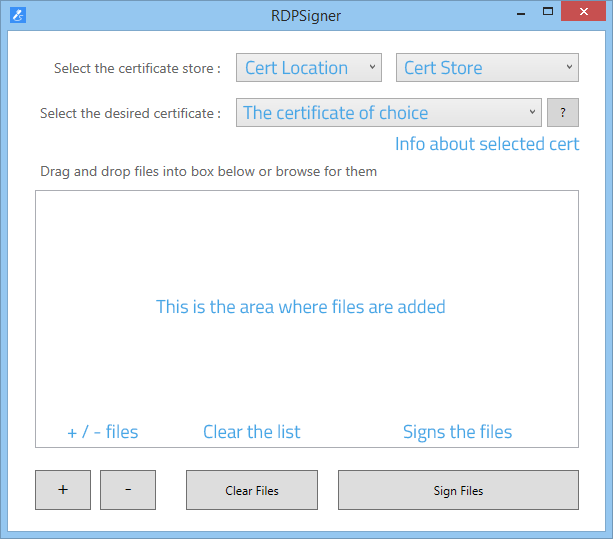 RDPSigner was built to be easy to use so you could happily skip reading this section and begin signing those RDP files straight away, however, for those of you that like reading about something before installing it (which we would always advise you do!) then here goes. Once RDPSigner is installed you can access it from the shortcut on your desktop, from the ‘RDPSigner‘ directory under the start menu or if you are on Windows 8 then from the recently installed programs under the start screen. When you load RDPSigner you will be met with the main interface (below). This is the core area of the application and is where all the magic happens. Once your required RDP files are in the list click ‘Sign Files’. The system will also show which files have failed down the right-hand side of the files area. 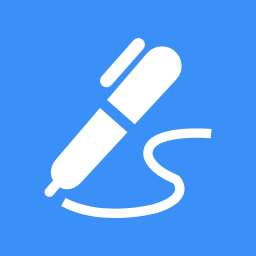 If you have had nothing but headaches over creating and signing RDP files then I hope that you find RDPSigner a useful utility to add to the tools at your disposal. Please feel free to share RDPSigner with whoever you see fit, but please do mention Sherr Technologies in the process … Happy Signing!! What RDPSigner does is automates the process of manually running rdpsign.exe against each of the RDP files with a specified certificate thumbprint. The above process is enough of a pain when signing one file, just imagine how much of a pain it would be for a large number. You could write a script that uses a TXT file as the source for a list of file paths, however, you would still need to adjust that TXT file every time you wanted to sign more files. RDPSigner takes the list of files you add to the window and iterates through each one running the command above. It then gathers the returned result of the operation and displays whether the attempt was successful or whether issues were encountered. That pretty much sums it up, hope you have fun using it.